To accelerate referrals and transitions in care. A critical gap in healthcare is caused by the referrals and care transitions sent via paper or fax. This is inefficient, not aligned with regulatory incentives, and hurts both the patient experience and care coordination. careMESH provides the tools to digitally create and send care transitions such as discharges or referrals, easily and cost-effectively. Our national provider directory makes it possible, enabling communication with any licensed clinician in the country. careMESH clients choose either an integrated or non-integrated configuration. When integrated to an EHR, users can automatically upload patient lists, medical records, contacts, and more. 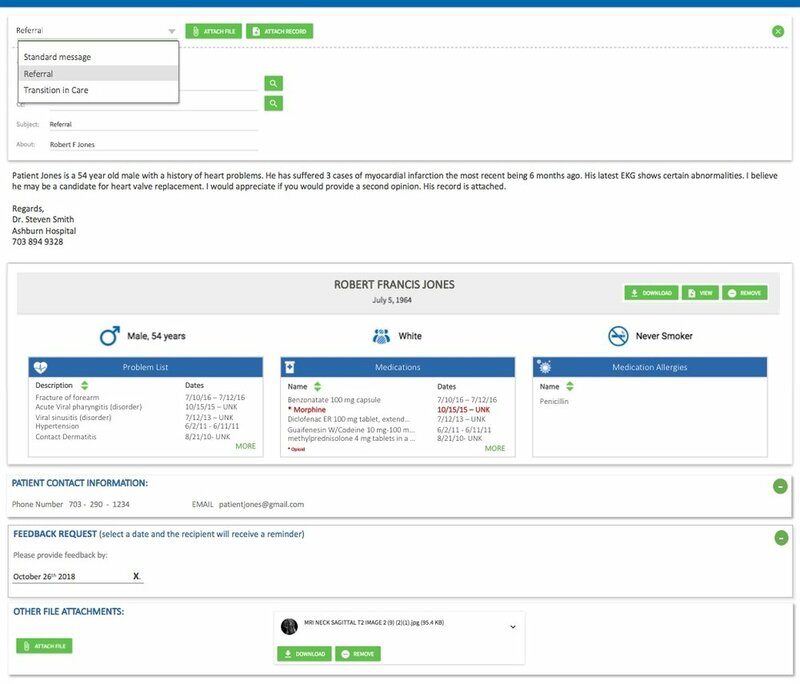 Even without integration, users leverage our intuitive software and pre-loaded referral templates (shown at right), to share patient records, files, notes, and more. This flexibility makes it possible for hospitals, practices, and others to create digital referral loops for improved communication and efficiency. Our directory includes 5.1M US clinicians, so you can communicate with any member of a patient's care team. Learn how careMESH helps you meet CMS's 2019 Meaningful Use Programs. In this short video, see how a physician practice, physician association, or ACO can benefit through secure communication and collaboration.